"Why does the new St. Vincent track sound a bit like Robyn, LCD Soundsystem, and Fischerspooner all at the same time? ", I hear you quietly ask, just before you've lost yourself in its utter brilliance. Well, I suppose you'd look no further than its two main actors - Annie Clark whose existing 'Slow Disco' has been given a masterful tweak by the prodigiously talented Jack Antonoff of Bleachers. Antonoff is no stranger to genius-level collaboration with amazing female solo artists - his co-write with Lorde on 'Green Light' was my #1 track of 2017, and he has worked with everyone from Carly Rae Jepsen to Grimes. 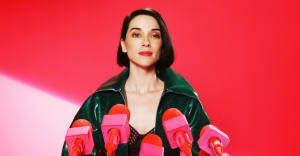 His collaboration here is no surprise, having been a producer on Clark's most recent St. Vincent album 'MASSEDUCATION'. Listen to the pulsating new 'Fast Slow Disco' and its more classically-led predecessor 'Slow Disco' (co-written by Joy Williams of Civil Wars) below. To channel one of the current contestants on 'Love Island', what a great pair. Find more info at ilovestvincent.com.